A turnoff toward the mountain leads to the principality of Mengwi which, until 1891, was the center of a powerful kingdom originating from the Gelgel dynasty. These kings continue to be venerated in the state temples of Mengwi, in particular Pura Taman Ayun. In Bali, each social unit of increasing size beginning with the family possesses a temple wherein they worship deified ancestors. The family ancestors are worshipped in the house temple, the clan ancestors in the clan temple, the founders of a village in the Pura Puseh, and previously the ancestors of a royal dynasty were collectively worshipped by a kingdom in the state temples. 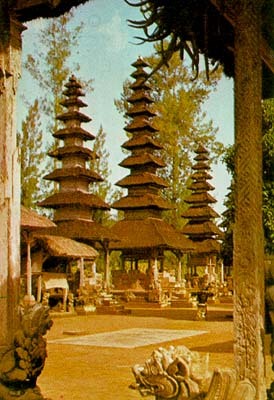 State temples include mountain temples, sea temples, and those at the heart of the kingdom, such as Mengwi's Pura Taman Ayun. Among the rows of palinggihs, (shrines that serve as "sitting places" to receive visiting deities during temple feasts) is a brick building facing east: the paibon, a royal ancestral altar. In the surrounding pavilions, priests recite prayers, village elders hold council, offerings are prepared, furniture and the temple's musical instruments are stored. For those interested in traditional woodcarving, the small doors of the shrines here are beautifully carved. The moat gives the impression of a sanctuary in the middle of a pond, explaining the name taman, "garden with a pond". The waters are a symbolic place of contact with the divine through widadaris, celestrial nymphs who bathe there. Beyond the moat, the temple lies on slightly rising ground. The grassy expanse of the outermost courtyard, the fine array of merus and pavilions in the inner courtyard, and its well-kept appearance make it one of the most beautiful temples in Bali. Originally dating from 1634, Taman Ayun was restored and enlarged in 1937. On its festival day (odalan) hundreds of women file into the temple bearing colorful offerings, which they place together before the merus.